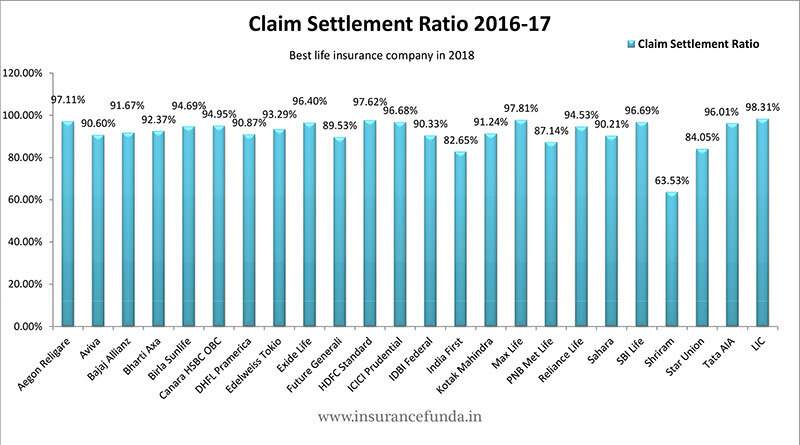 IRDA Claim Settlement Ratio 2016-17 – Best Life Insurance Company in 2018 in terms of Claim Settlement. Claim settlement ratio (CSR) is one of the most important statistics of an insurance company, which can give you a fair idea on how much you can trust it. The prime duty of an insurance company is to settle the claims, in a fast and prudent manner and give the insured amount to the policyholder, on the occurrence of the insured unfortunate event. Insurance Regulatory and Development Authority (IRDA) in its annual report for 2016-17, throws light on the claim settlement practices of Life insurance companies of India. Note: Insurance Funda has published a newer article on this subject. IRDA Claim settlement Ratio 2017-18 – Best Life Insurance Company in 2019. What is Claim settlement Ratio (CSR) and why is it so important? Claim settlement ratio is the percentage ratio between the claims settled and the claims received in the period of time. For example, if a company receives 100 claims out of which 90 claims are settled then the claim settlement ratio of the company is 90 %. Claim settlement ratio can be calculated based on the number of policies or on the amount of claim settled. Ratio of the claims settled will give you a clear idea on the satisfied customers of the company. Further to add, the trust of the policy holders in an insurance company is directly related to its Claim Settlement Ratio. Insurance industry in India 2016-17 highlights. At the end of March 2017, 62 insurers are operating in India. Of which 24 are life insurers, 23 are general insurers, 6 are health insurers exclusively doing a health insurance business and 9 are re-insurers including foreign re-insurers branches. Bifurcation between the pubic sector and private sector insurers are as per the chart given below. The table given below can give you a fair idea on the business under written by life insurers and their market share for 2015 – 16 and 2016-17. Along with the claim settlement ratio, operating expenses of a life insurance company is also an important factor to take care off. Lower the expense ratio, higher is the chance to receive a better bonus rate for insurance policies. IRDA Claim Settlement Ratio 2016-17 or up to 31st March, 2017 is shown as a chart here. Colour codes are used to understand the ratios easily. Green colour is provided for best performance while red is used to denote worse performance. As there is lot of data in the above info-gram, let us break it into small aspects to understand it in a better way. The info-gram provided below shows the claim settlement ratio based on the number of policies. Insurers are divided into three categories based on the claim settlement ratio. Life Insurance Corporation of India (LIC) continues to top the chart with an amazing claim settlement ratio of 98.31%. On the other hand, Shriram life settled just 63.53 % of Claims. Insurers are divided into four categories based on there claim settlement ratio. Four companies tops the chart with a claim settlement ratio of 97 % or above. If we decide the insurers based on the above data only, the best insurers will be (1) LIC (2)Max Life (3)HDFC Standard (4) Aegon Religare and (5) SBI Life. But it is not a perfect method to completely depend on the claim settlement ratio based on the number of policies alone. Claim settlement ratio based on the benefit amount also has to be analysed. The info-gram given below compares the claim settlement ratio of the insurers based on Benefit amount and Number of policies in a side by side manner. When we analyse the top five companies we can easily detect an anomaly in case of the two insurers namely HDFC Standard and SBI Life. Even though the claim settlement ratio based on the number of policies are fairly high, the ratio based on the benefit amount shows very low values. What we can understand is that there is a difficulty in settling high sum assured death claims in both of these companies. If we analyse the above table we can find similar anomalies with other companies also. As the info-gram is self explanatory there is no need to explain it further. Time taken to settle the death claims is also an important factor to consider while selecting the insurance company. This info-gram provides complete details of the time taken to settle pending cases by various companies. You can see that some companies are taking more than one year to settle a considerable portion of their pending claims. For example, Future Generali took more than one year to settle 88.24% of their pending claims. Despite a large number of claims being settled, LIC has settled 86.98 % of their pending claims within a period of 3 months. Conclusion: As the prime motive of taking an insurance policy is to get the claim amount on the occurrence of the insured unfortunate event, it is always advisable to select your insurer wisely. Claim settlement ratio must be analysed based on the ‘number’ and ‘benefit amount’ to get a complete picture. Life Insurance Corporation of India which is the only public life insurance company, tops the chart and remains the most trust worthy company in both the counts.